Matt Bowen holds a Ph.D. in high energy physics which led him to an interest in nuclear energy policy. He’s the author of a recent recent report on small modular reactors (SMRs) published by the Nuclear Innovation Alliance (NIA). The report, previously profiled here on Neutron Byes, contains a series of recommendations to promote the market for SMRs. I asked Bowen to name his number one recommendation. He replied that an expansion of the production tax credit for new reactors is a key financial success factor. Beyond that Bowen would like to see power purchase agreement with federal facilities including national labs, utilities like TVA, and military bases that favored SMRs. At the same time Bowen said that getting congressional attention on these issues in the tax bill may be a challenge since advocates for renewable energy technologies will undoubtedly weigh in against a pro-nuclear tax policy. Bowen added that he’s referring to interests that advocate a 100% renewables solution to decarbonizing the electric grid. Two other events could have a drag effect on congressional support. The first is the cancellation of the V.C. Summer plant that was supposed to build and bring online 2200 MW of CO2 emission free nuclear power. The second is the bankruptcy of Westinghouse which is the key supplier on the project. It’s not clear how much support for nuclear energy exists in Congress for expansion of these credits for full size reactors or SMRs. In a discussion about prospects for SMRs in the U.S. I asked Bowen where else besides Idaho, which is slated to be the home of NuScale’s first SMR, that SMRs might flourish. Bowen said that prospects in deregulated states, merchant markets, seem poor. However, he noted that earlier this year Wisconsin removed its three decade old ban on new nuclear power plants and might be receptive to an SMR being located there. One area where uncertainty remains is the question of how many SMRs a vendor needs on their order book before investors will put up the money to fund construction of a factor to turn them out in large numbers. Estimates range from a low of just 10 (former Energy Secretary Steven Chu), to up to 40 (Rolls Royce in the U.K.). Bowen said it is still to early to say what certainty that number will be. Speaking of the the U.K. Bowen noted that the recent SMR competition, which held out a “prize” of $250M is not enough to get the market going in that country. Recent press reports indicate that Rolls Royce will be name the winner. Asked to name an advanced nuclear reactor developer in the U.S. that intrigues him, Bowen mentioned Kairos Power. According to its website Kairos Power technology uses a novel combination of existing technologies to achieve new levels of economy, safety, flexibility, modularity and security for nuclear power production: the Fluoride Salt Cooled, High Temperature Reactor (FHR). The fuel is based on uranium. The design is intended to support load following. In the policy realm Bowen says the U.S. must reclaim its technological leadership role, especially with SMRs, if it wants to have a credible voice globally on nonproliferation issues. Ashley Finan, Bowen’s colleague at NIA, holds a Ph.D. in nuclear science and is an advocate for the use of SMRs for high temperature process heat applications. In her interview with this blog, and later at an ANS panel, Finan said there is a high potential for SMRs to served non-electricity applications. To address the complex licensing applications that would result from multiple uses, she called for regulatory reform to “stage” licensing so that as each use of reactor heat is ready to come on line the utility can update the license rather than trying to authorize all uses all at once. She calls this a “modular approach” to standard design approval. The idea is that the sum of all applications represent the total heat available from the reactor. She said that regulatory complexity needs to be streamlined. How Mature are Advanced SMR Development Efforts? 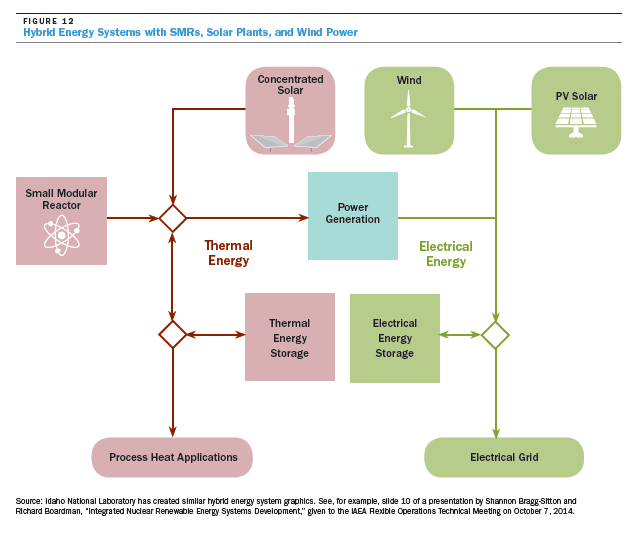 The NIA cited work done by several Department of Energy national labs on technology readiness levels (TRLs) or various design elements of SMRs. The concept of TRLs was developed by NASA to assess how ready its technologies were for the rigors of space flight. While the table below shows relative low numbers for some design elements, it also represents an opportunity. Every one of the rows in this table is really an element of the supply chain of design efforts to deliver a TRL score of 6 or more for advanced SMRs. It would seem to be a reasonable strategy for DOE to fund and parcel out work on each of them to its national labs, based on their core competencies, in a complex-wide effort to move the commercial delivery date of advanced reactors from the mid-2040s to the early 2030s. If TerraPower can set forth plans to meet that milestone, early 2030s, of shipping a commercial version of its advanced reactor, in collaboration with Chinese nuclear energy experts, why can’t others, with DOE help, do the same? During the same panel, Shannon Bragg-Sitton, a Ph.D., nuclear scientist from the Idaho National Laboratory, talked about the development of an advanced simulation tool to model “hybrid systems” of nuclear reactors for both electricity and non-electrical applications and load following to work with renewables. In a separate session on nuclear startups, John Kutsch of Terrestrial Energy also thinks the market for process heat is the way to go for SMRs based on advanced technologies. Key applications include process heat for heavy industry, petrochemicals, and for hydrogen production via steam reforming. Desalinization i also a good prospect. Terrestrial Energy is developing a molten salt reactor to serve process heat applications as well as electricity generation. In the next panel Mark Shaver, a nuclear engineer at NuScale, predicted the firm would break ground in Idaho in 2023. He said the key success factor for NuScale in making rapid progress with its light water type design is having a test facility at Oregon State University. In a panel on nuclear energy and the media, a group of very experienced DC-based journalists agreed with the premise that covering the industry is very complicated. Amy Harder, formerly a reporter with the Wall Street Journal, and now with the online news service AXIOS, said that folks on the nuclear side need to be patient in dealing with the news media. Jonathan Landay, a reporter with Reuters, added that journalists will ask a lot of questions. “We’re not stenographers,” and he added that good reporters will follow the facts where ever it takes them. But he added that reporters do make mistakes and the Internet is great for getting corrections. “If you have a concern about something a reporter has written, look them up and get in touch,” he said.